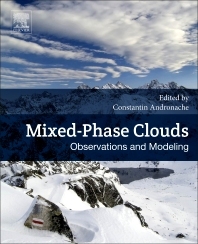 Mixed-Phase Clouds: Observations and Modeling presents advanced research topics on mixed-phase clouds. As the societal impacts of extreme weather and its forecasting grow, there is a continuous need to refine atmospheric observations, techniques and numerical models. Understanding the role of clouds in the atmosphere is increasingly vital for current applications, such as prediction and prevention of aircraft icing, weather modification, and the assessment of the effects of cloud phase partition in climate models. This book provides the essential information needed to address these problems with a focus on current observations, simulations and applications. Constantin Andronache received his PhD in Atmospheric Sciences from Georgia Institute of Technology. After a postdoctoral appointment at Princeton University, at the Geophysical Fluid Dynamics Laboratory, he worked on cloud physics and radiative transfer at Atmospheric and Environmental Research in Lexington, Massachusetts. Afterward, he joined Boston College and is now a senior researcher. Dr. Andronache’s research interests include aerosol-cloud-climate interactions with a focus on the microphysics of cloud formation and aerosol processing by clouds and precipitation. His primary areas of expertise are atmospheric physics, remote sensing of aerosols and clouds, and using mathematical techniques for data analysis and the modeling of atmospheric processes.